I had an opportunity last week to go to Ontario CA to see the Road to California Quilt Show. Wow! What a show that is. My husband, Gil, and I went on Thursday. We were there around 10:30 a.m. It was busy but not too bad. About noon people started just streaming in. When we left a couple of hours later, we could hardly move through the crowd. I was really glad we had seen all the quilts by then. The quilts were unbelievable. They were of such high quality both in the design and the quilting. Competition came from everywhere. There was a quilt that was hand stitched that came from Fargo North Dakota that was stunning. The stitching was absolutely perfect! Truly admirable. A challenge was done that was probably the most inspiring thing I saw. The challenge was to get the fabric that everyone else had, make a small (around 18" square) quilt using the same design everyone else had, and then quilt it the way you wanted to quilt it. The fabrics were blue and yellow. These quilts were all hung on a wall together, so you could see them all at once. If you did not see they were all the same up close, then you would not have thought they were identical quilts, except for the quilting. One quilt was quilted so close using yellow thread that you thought the quilt was done in yellow fabrics. It was fascinating to see the different patterns used to quilt and what a difference the quilting made on them. 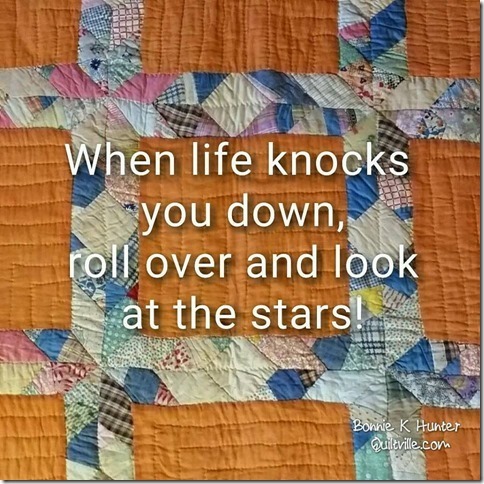 Makes you think twice about how you will quilt something. It definitely changes the appearance of the quilt. Vendors were everywhere. I think there might have been as many vendors as there were quilts. I went see what they had and the pricing they had. There were a lot of kits. Having made kits for the store before, I felt they were on the high side dollar-wise. They were beautiful, though. Lots of patterns. I am always looking for unique wall hangings, and I saw several of those. I even bought a chicken head pattern that looked like she might have been a follower of the Grateful Dead. I have to make this one quickly, as it is just too funny. I also bought some thread that I had never heard of. It is a long arm quilting thread. I will let you know what I think of it after I get a chance to try it. I bought some very colorful mesh--the kind you see in totes. Beautiful colors out there. I knew colors were there, but I had only seen black. This opens up great possibilities when making totes. I met a lot of vendors that sell wholesale and saw several unique notion ideas that I want to sell at shows. This quilt show is a big one. It is the 15th anniversary of their show. They start early in the week with classes from big time teachers. I was not able to attend any of those, as it was my granddaughters birthday and we were at her house a couple of hours away. Next year I will plan to be at some of the classes and work around her party. Then the show itself runs from Thursday through Sunday. As busy as Thursday was, I cannot imagine what the weekend days turnout was. This quilt show is every year about the same time. Plan on attending next year. You will love it. I hope your New Years has gone well and everything is back to normal after the holidays. 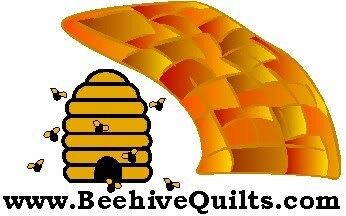 I have been researching some quilt blogs and came up with a couple of new ones that are posted on the blog list. You might find them interesting, too. One is at http://karenquilt.blogspot.com/ and the other is http://womenonquilts.blogspot.com/. Life is good. I have been working on some of the quilts that I needed to finish and never seemed to find the time to do anything with them. I finished two Christmas quilts. One was to be done for Christmas in 2008. The other I started in September 2009 and wanted for this past Christmas. Oh well there is always next Christmas. I have also quilted two other quilts. One is a baby's quilt made of little ducks. Another one is a fall quilt that is twin size. Both need their binding done. I want to do both soon because it is fun to curl up with a warm quilt and do hand work this time of year. Using the short arm machine that was in the store is fun once the quilt is on the frame. It takes a lot of time to get the quilt on, especially when you do it wrong the first time. But once I get started sewing, I have fun with it. Now I just need to learn more quilting designs. All else is good. My puppy Mochi is growing and lots of fun for my husband and me. More later.